What Day Of The Week Was December 5, 1977? 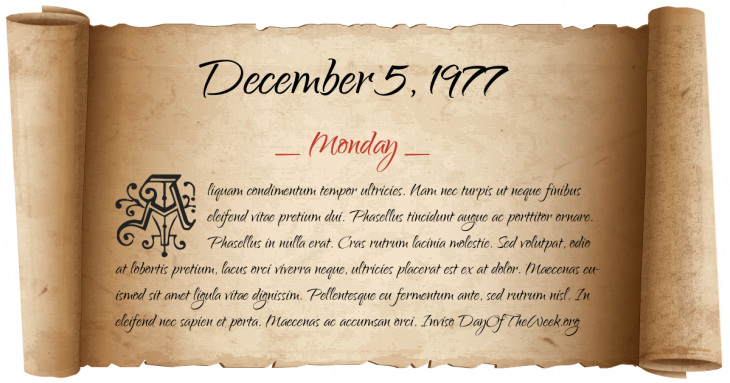 December 5, 1977 was the 339th day of the year 1977 in the Gregorian calendar. There were 26 days remaining until the end of the year. The day of the week was Monday. A person born on this day will be 41 years old today. If that same person saved a dollar every day starting at age 6, then by now that person has accumulated $12,921.00 today. Egypt breaks diplomatic relations with Syria, Libya, Algeria, Iraq and South Yemen. The move is in retaliation for the Declaration of Tripoli against Egypt. Who was born on December 5, 1977?